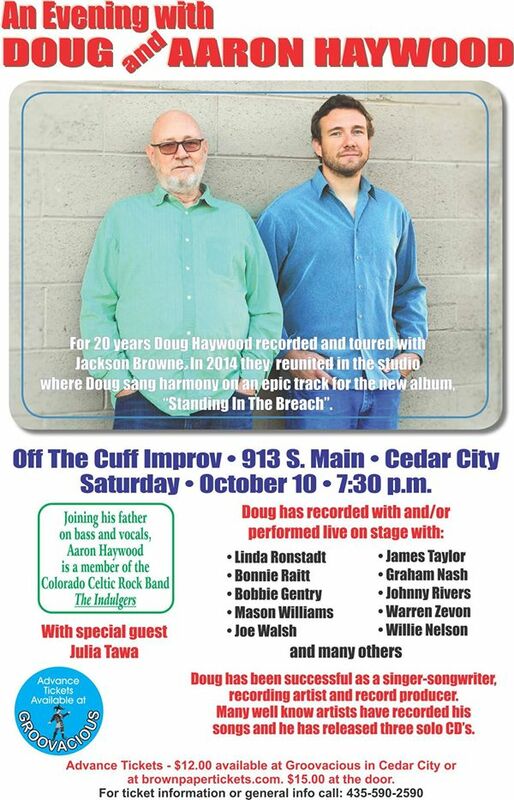 CEDAR CITY — Singer-songwriter and father-son duo Doug Haywood and Aaron Haywood will perform Saturday, 7:30 p.m., at Off the Cuff Improv, 913 S. Main St. in Cedar City. For 20 years, Doug Haywood recorded and toured with Jackson Browne. In 2014, they reunited in the studio, where Doug Haywood sang harmony on an epic track for the new album “Standing in the Breach.” He has been successful as a singer-songwriter, recording artist and record producer. Joining his father on bass and vocals, Aaron Haywood is a member of the Colorado Celtic rock band The Indulgers. The band was formed in 1998, and Aaron Haywood joined the group in 2010. Saturday’s performance will also feature special guest Julia Tawa. 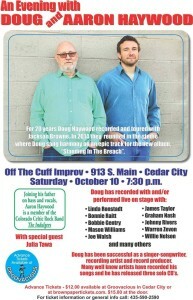 Advance tickets are $12 at Groovacious, 173 N. 100 West in Cedar City, or available online. Tickets are $15 at the door the night of the event. When: Saturday, Oct. 10, 7:30 p.m.